De Ark Mountain Lodge with its breath-taking views on the mountains and the picturesque village of Clarens, is the place of restoration for those in need of silence, nature and solitude. 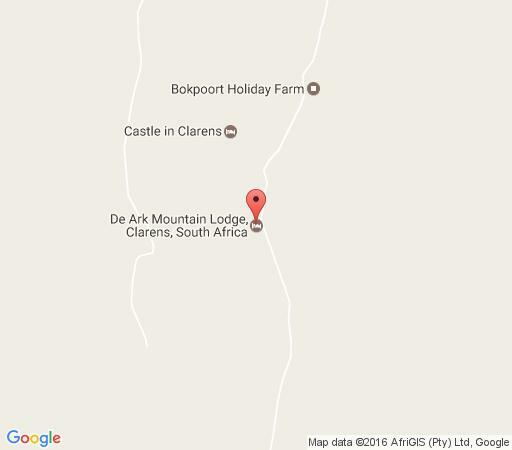 Elevated above the village of Clarens below, De Ark is strategically located adjacent to the Golden Gate national Park (20 km drive from entrance) and 7 km drive from Clarens town centre, with its vibrant village life. The lodge consists of 4 standard double storey chalets sleeping 4 each (2 adults and 2 children only), 2 single storey chalets sleeping 2 each . All chalets are equipped with en suite bathrooms, fire places and patios with sweeping views of the mountains - a true gem of the Free State! The farm has some of the most beautiful landscapes which can be experienced when taking an early morning walk, mountain bike ride or on horseback amongst the Zebras, Bontebokke, Swart Wildebeest, Springbok and Eland. Take that break that you so well-deserve. Enjoy hiking on the game farm near Clarens and walk with Eland, White Tailed Gnu, Blesbuck, Springbuck, Zebra, Red Hartebeest, Grey Rhebuck & Mountain Reedbuck. Take a dip in a crystal clear mountain pool! If you are looking for accommodation in Clarens, South Africa, or accommodation near Golden Gate National Park, South Africa, look no further! Be our Guest at De Ark Mountain Lodge. ALL RATES ARE INCLUSIVE OF BREAKFAST Terms & Conditions Rates are quoted per person per night in ZAR (South African Rand). Rates are at the discretion of DE ARK MOUNTAIN LODGE and are subject to change. All rates include breakfast All standard terms and conditions apply. Dinner by prior arrangement only (Booking essential 48 hrs prior to arrival). Bookings are secured upon written confirmation and receipt of full payment by DE ARK MOUNTAIN LODGE. Bookings are only considered cancelled once written confirmation of cancellation has been received from guests. The owners and management of DE ARK MOUNTAIN LODGE cannot be held responsible for any loss or damage to property or for possessions of guest occupying the lodge. Check-in time 14h00 Check-out time 11h00 Child Policy Free for children up to 2 years (Standard rates apply for children 2 and above) Cancellation policy Cancellation 14 days or less before arrival, on day of arrival, during the stay, no show - full payment due Cancellation 15 - 28 days before date of arrival - full 50% deposit payable Cancellation 28+ days before date of arrival - refund of deposit Please note that all refunds are subject to a 5& handling fee on the full booking value. We really enjoyed staying at De Ark. The views are amazing, the food and service great. Miguel has got his hand on every aspect and really went that extra mile to make our stay great. Good day we enjoyed our stay there, however did find the mattress a little soft, and the one night used the fire place to find we were getting smoked out, apart from that it was lovely. Friendly staff and nice welcome. The usual problem as at most guest houses. There were sufficient plug points, but very poor light in the bedroom especially at the mirror. How do you dry your hair, do your make-up without being able to see yourself properly?. The one bedside lamp was broken. The dinner and breakfast were good and reasonably priced.There should have been a warning about the long, steep gravel road especially in the rain. Damage to a decent sedan car can dampen the spirit of a pleasant stay.